From the Jane Austen Centre. This year we had a surprise visitor from the Jane Austen Centre when one of their guides arrived in his work clothes to show us his relative's name on the memorial. We were told that Mr John Densem was making a special visit to Bath with his family to make a visit to the grave of his friend and fellow Home Guard member Allan Woods, who was killed in the 3rd raid whilst fire watching in Catharine Place. So we invited them to our service as our special guests, and themed the event to the Julian Road area, where Allan Woods lost his life. 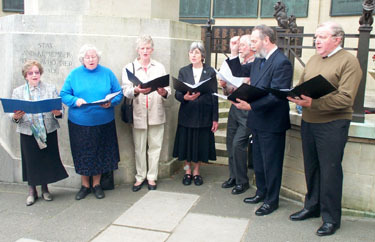 A group of singers opened the service with "All In The April Evening" by H.S.Robinson. Doreen Williams, Ros Key Pugh, Diane Dobson, Diane Gibb, Joe Baker, Jeremy Key Pugh, Colin Dobson. 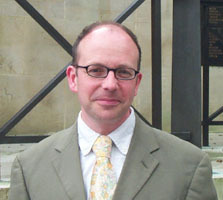 Welcome and Introduction, by Stuart Burroughs. Stuart had come from the Museum of Bath at Work to welcome everybody, introduce Mr Densem, and tell the story of Allan Woods as Mr Densem had recounted it. Mr John Densem from Malmesbury has came to Bath at the age of 86 to pay his respects to a friend who died in the blitz, Allan Woods. The Story Of Allan Woods. John Densem and Allan Woods were in the same Home Guard Unit together, and they both decided they would like to volunteer to join the RAF. However, Allan's father suggested to his son that he should stay for a while longer, under the leadership and tutelage of Mr Leonard Smith, to gain more experience and knowledge of engineering and thus have a better position in the RAF when he eventually joined. He listened to his Father and stayed. Thus it was that Allan Woods, a 19 year old trainee motor mechanic from Fairfield Park, remained a private in the Home Guard. He was on firewatching duties at Norton Dairies in Catharine Place with another private from the Home Guard, 17 year old Frederick Park, when the third raid on Bath began. At about 1:30 in the morning of the 27th of April 1942, Norton Dairies received a direct hit. The building was destroyed and both Allan Woods and Frederick Park were killed. 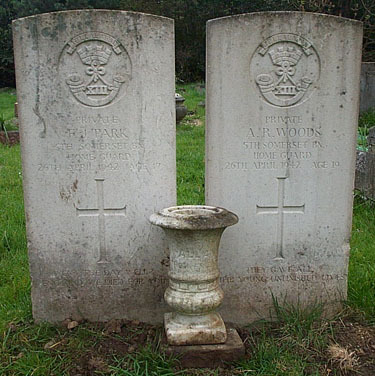 They died together, and were buried alongside each other in St Michael's Cemetery. But the tragedy does not end there. Allan had delayed joining the RAF in order to be trained by Mr Leonard Smith, who was also killed that night. Mr Smith was in the National Fire Service, and that night he was on duty as part of the team fighting the fire at the Bath Assembly Rooms. An unexploded bomb that had fallen in the Circus earlier, went off while Mr Smith was nearby. He was the only Fireman to lose his life while on duty in Bath during the War. The Blessings, by Jeremy Key Pugh. The singers ended the minute's silence with "Be Still My Soul" by Jean Sibelius. Laying the Wreath, by Emily Curtis. 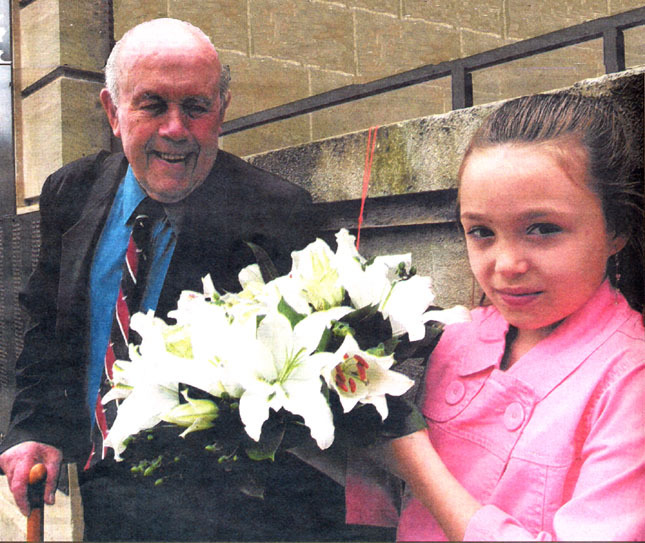 Emily laid the wreath in memory of her Great Grandfather John Densem's friend Allan Woods, who was killed by a bomb in Catharine Place during the third attack. The Wreath, donated by Crescent Flowers. 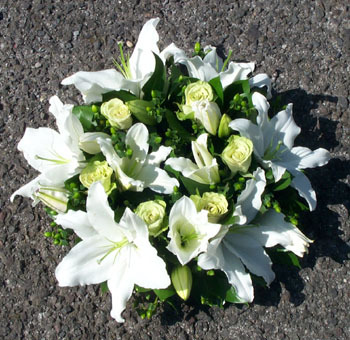 Many thanks to Crescent Flowers of Crescent Lane (Julian Road) for their kind donation. Survivors in the Julian Road area. 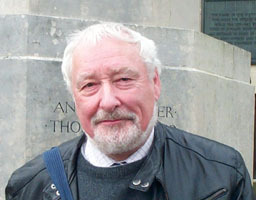 John Penny related three stories, of Terry Gay, of Peggy Wake and of Mary Dale. Terry Gay's story has been added to the Memories Book; Peggy's has been added to the Adults page; Mary's story appears in the Chronicle report below. Nobody remains, but we will meet here again next year, on 26th April 2009 at 3 pm. 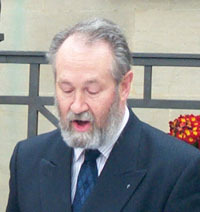 Click here for information about the plans for the 2009 ceremony. 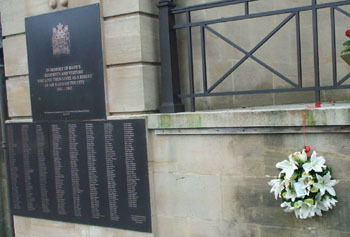 A ceremony of remembrance has been held for the hundreds of people who died in the Bath Blitz 66 years ago. Relatives of those who lost their lives, and survivors, gathered in Royal Victoria Park on Sunday to pay tribute to those who died in two terrible nights of bombings in 1942. 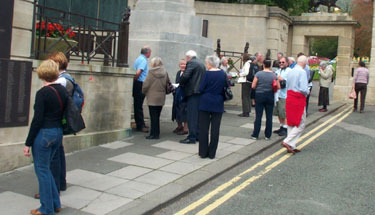 The event was organised by the Bath Blitz Memorial Project, set up in 2001 to provide a permanent memorial for the 417 people who died in the city between March 1941 and April 1942. It particularly focused on the 404 victims of the bombings on April 25 and April 26, 1942. 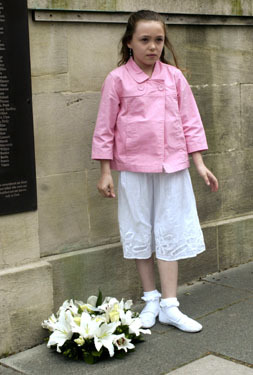 A wreath was placed at the cenotaph by Emily Curtis, aged 10, the great-granddaughter of John Densem, who was a member of the wartime Home Guard. 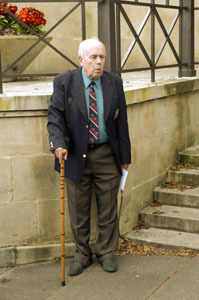 Mr Densem, aged 86, who now lives in Malmesbury, attended the service to pay tribute to his friend Allan Woods, who was also in the Home Guard and was being trained as a motor mechanic by Leonard Smith who was the only fireman to lose his life while on duty in Bath during the war. 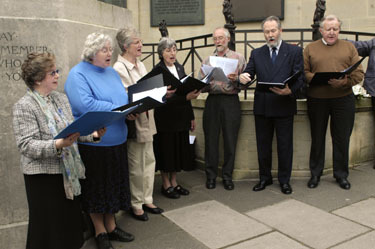 Singers drawn from choirs across the city performed "All In The April Evening", and a minute's silence was observed. "On the first night of the blitz of Bath, my father came indoors and told us to leave immediately. As he spoke the house rocked and a heavy clock fell down and dented his tin hat. My brother and I, seated on a settee, were hurled across the room as the Georgian shutters blew in with the blast. We never saw the cat again. We could feel the intense heat when we ran from Rivers Street as the houses at the west end began to ignite and the flames spread along the street towards our house. A German plane swooped down and opened fire. Bullets echoed around us and instinctively we lay down in the gutter whilst the plane zoomed over us and away, to wreak havoc elsewhere. The service also heard the story of Terry Gay, who lived in Twerton and was forced to run to an air raid shelter dodging machine gun fire. St Andrews Church just visible through the smoke.